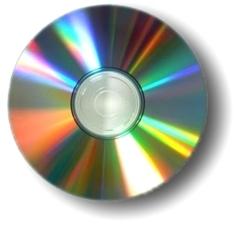 The CD is thirty-five years old, and development of the format started over forty years ago. In the early stages of CD development, it was planned to make CD a 14 bit format and, even at the launch in 1982, most of the commercial digital to analogue converters were only 14 bit devices. With only 14 bits resolution, quantisation errors on critical programme were perceptible and so the Red Book CD standard allowed for the inclusion of optional, analogue pre-emphasis of the signal prior to analogue to digital conversion with corresponding analogue, treble de-emphasis filter after conversion back to analogue in the player. This technique raised the level of the treble modulation prior to the A to D converter to a point where the quantisation noise was a smaller proportion of the signal level, thereby improving linearity. And the de-emphasis in the player further reduced the audibility of the remaining quantisation errors by attenuating the high frequencies where they are most easy heard. The presence of emphasis was signalled by a dedicated control bit in the recorded bitstream which the CD player detected and switched in the de-emphasis filter as required. By the end of the 1980s, converters had improved enormously and were delivering a performance which rendered emphasis and de-emphasis obsolete and its use gradually fell out of fashion and favour. Nevertheless, many CDs for the first ten years of CDs commercial life were recorded with pre-emphasis; especially those produced by Denon in Japan, both for their own label and on CDs produced by them for other labels. This was especially the case for classical music releases. But there exist rumours that some CDs of indie labels, even today, opt to record with pre-emphasis. Unfortunately, some modern CD players do not implement de-emphasis, and the situation with CD rips is even more haphazard. For example, Windows Media Player replays CDs with de-emphasis when it detects the signal in the bitstream, but CD rips made with the software do not de-emphasise the signal. Thus, the music collector is bound to come upon pre-emphasised digital music files from time to time and these need de-emphasis if they aren't to sound very strident and harsh because CD pre-emphasis is not subtle, it is nearly as powerful as that applied to LP records with a 10dB high-frequency shelf at 10kHz. 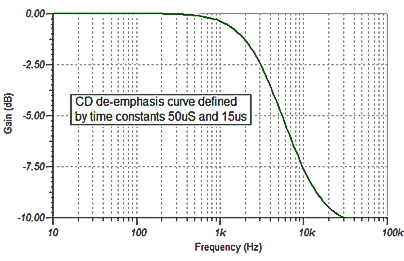 (The CD pre-emphasis is defined by two time constants: 50μS and 15μS). 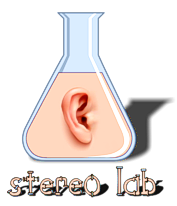 For these reasons, Stereo Lab includes a very accurate implementation of the CD de-emphasis filter which may be used to correct music files with pre-emphasis applied.